Although models of the very early era are unlikely to justify mass-production methods, by using a variety of materials old and new, together with some of the latest production processes, Parliamentary Trains can carry out rapid test builds and speedily correct errors, and keep prices competitive with short production runs, which we can quickly repeat. 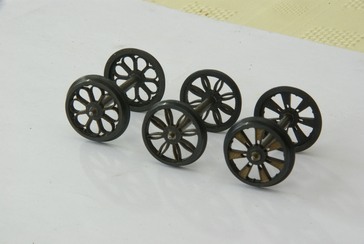 Carriage, wagon and road vehicle kits come supplied with wheels. Carriages and wagons can be run with a variety of wheels, and the choices are given towards the bottom of this page. Laser cut parts are made from various types of plastic sheet and card. Our early kits were of MDF and card, but these have been updated to a type of plastic. Recent and upgraded kits all have tabbed parts. We can still produce MDF versions if you’d prefer. MDF and card are fairly absorbent so in order to make gluing and painting easier, we prime the parts with shellac solution before cutting. All our kits are test built, modified to eliminate faults, and are test built again until they go together without fuss. We pride ourselves in our instructions; so much in fact we usually have a spare copy or two on our exhibition stand. If we can work out how to do it, we’ll put a download version on the web site. The need for soldering has been minimised as far as possible. Much of the assembly can be done with adhesives. We recommend ‘fish glue’, which we sell, give a strong bond combined with plenty of ‘wiggle’ time. Otherwise we have found that a thin grade of cyanoacrylate (runny superglue) will do the job. Although the manufacturers claim a quick bond, we find it takes a little longer than expected unless it happens to be two or more fingers when it bonds with surprising speed - be careful! A further point to remember is that cyanoacrylates can cause nasal irritation in some people. If you are affected, an odourless grade is less likely to cause problems. And finally, keep these glues away from children. Etched parts are retained in their sheets by the usual small tabs, which can be cut through with a small chisel on, for example, a sheet of aluminium. Don’t cut them out until you need them. There are also very small tabs for plastic and cardboard parts, but MDF parts are held in place with two ‘tacky’ plastic films. If you have any problems with building our kits, please email. We’ve built our own kits so can easily help. Any suggestions would be welcome too. If you wish to add passengers, we hope to produce a range of resin Victorian figures. We think white metal would not be suitable due to the weight, unless you are only adding half a dozen. At present, there is a choice of eleven types of wheels -see the ‘Wheels’ page - including a number suitable for chaldrons. These are all fine scale. Kits include wheels of your choice. When buying using Pay Pal, please ensure you also go to the wheels page and choose your wheel types.When ordering by phone or mail, please state your preference by telling us the type of the wheels you would like. Shown left are Bramah, Losh & Bell and Haddan wheels. The early railways tended to buy their wheels from outside manufacturers. We believe that different wheel sets were used on the same type of vehicle, and wouldn’t be surprised if two types were used on the same carriage or wagon in emergencies. An early Stockton & Darlington carriage at Shildon has Bramahs on one axle and split spokes on the other! London & Birmingham Railway’s first set of Timber Bolsters, were in use until at least the mid 1880’s when new versions were introduced by the LNWR.